Still in his twenties, Ashley Cole is fast on the way to becoming England's most capped full back. He has been the first choice left back for England and both his clubs, Arsenal and Chelsea, since the beginning of the century. A real modern attacking full-back, his speed and agility enable him to support the attack by overlapping the winger or left midfield player and delivering excellent crosses. Cole came through the ranks at Arsenal and developed as an attacker at first, which explains his attacking instincts. He played for the first team in 1999 and followed up with a full Premiership debut the following year, when an injury to the then first choice left-back, Silvinho, allowed Cole to establish himself in the senior side. After four Under-21 caps and one goal, Sven-Goran Eriksson, the then England manager, gave Cole his senior debut in a World Cup qualifying match against Estonia in 2001. Once again Cole quickly established himself as first choice at that position. The only other serious contender for the role has been Chelsea's Wayne Bridge, but he has consistently been second choice since his debut in 2002, usually only getting games when Cole is injured. Cole went to the 2002 World Cup, held in Japan and South Korea, and played in every game, with a young England side acquitting themselves well, going out in the quarter-final to Brazil, the eventual winners. Cole's unfussy performances impressed back home although his tackling was sometimes considered rash, but considering he was only 21 at the time it was an excellent performance. It was at the 2002 World Cup that Cole came closest to scoring a goal for England, in the group-stage draw with Nigeria that put England through. With both sides wilting in the 34 degree and seemingly prepared to settle for the draw, his mishit cross from the byline swerved goalward and bounced off the cross-bar. Cole went to the European Championship in 2004 and again delivered excellent performances, being one of only four England players selected by FIFA for the all-star squad. The team performance was disappointing though, with defeat at the quarter-final stage to hosts Portugal, on penalties. Back home, Cole had won the Premier League twice and the FA cup three times with Arsenal, and also appeared in the UEFA Champions League final defeat by Barcelona, but was reportedly disappointed at not getting the stellar wages that were being offered by other clubs. In June 2005 he was caught being approached by Chelsea officials in a 'tapping up' operation that broke the FA's rules for club-to-player negotiations. Having been fined for this offence, rumours about his departure would not be silenced and he eventually joined Chelsea over a year later for six million pounds plus William Gallas. Having achieved so much at Arsenal many people feared that Cole would go the same way as many of Chelsea's apparently rash big-money signings since the arrival of Russian billionaire Roman Abramovich, and not fulfil his potential. But it seems that the reverse has happened, and, despite the odd injury, he has made marked improvements in both his defensive and attacking game since the move. 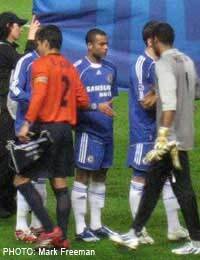 The move to Chelsea meant that he was now competing with Wayne Bridge at club as well as national level, although at times during Chelsea's injury ravaged 2006-07 season the fans were treated to the sight of both Bridge and Cole on the left, switching between wing and left full-back! But at national level at least, Cole was still the favourite going into the disappointing World Cup of 2006 in Germany. He performed well, with one memorable moment when he stopped Ecuadorian striker Tenorio as he went one-on-one with England's keeper, Paul Robinson, in the second phase match. Cole raced back to get a crucial tackle in which deflected the shot onto the crossbar, and England went on to win, courtesy of a David Beckham free kick. The team stumbled a the next stage, however, losing on penalties to Portugal in the quarter-final once more, and they returned home to much criticism, now seen as mature, overpaid under-achievers rather than the promising young squad of four years earlier. With England's even worse performances since then, Cole was denied the chance to appear at Euro 2008, as the team failed to qualify. He suffered a long-term knee injury in January 2007, missing most of the rest of the season. But since recovering he has re-established his place at Chelsea and in the England team. He was a key player during the near-perfect World Cup 2010 qualification, part of a defence that only conceded six goals, and it is hoped that standard will be maintained at the tournament in South Africa.